This photo shows me with my Icom IC-R5 communications receiver as well as my Yaesu VX-8R transceiver riding securely in place in my radio chest harness. Also included is an off-set attenuator mounted on my Icom IC-R5 and connected to my take-down yagi that works extremely well once you close in on the foxbox, and attenuation is required to get a more precise fix on the fox. 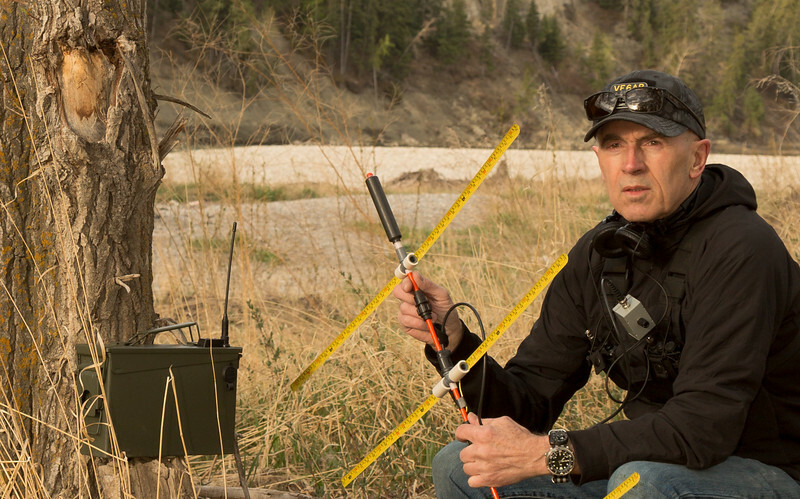 The 2 meter foxbox in the photo began life as a 30 caliber ammo-box and includes a 2 meter HT with a controller/timer, as well as a gel-cell battery and an external antenna. Of course it goes without saying that I had an unfair advantage on this day while hunting for the foxbox as I hid it. I was out in the field running tests with the various components shown and described here to familiarize with how they operate under actual test conditions. When I'm done fox-hunting I can switch from my Icom IC-R5 receiver with its companion offset attenuator to my Yaesu VX-8R transceiver, allowing me to communicate with distant stations through the use of my dual mode take-down yagi. It just takes time and perseverance and you can succeed in anything you set your mind to. As far as working with machine tools, take classes in machine shop work, acquire the tools and start making chips, that's what I did.